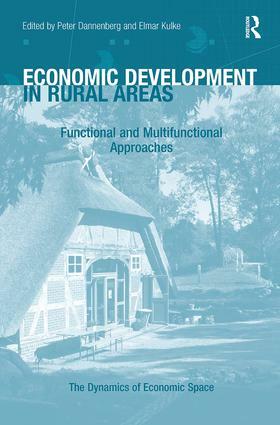 Analysing the ongoing changes and dynamics in rural development from a functional perspective through a series of case studies from the global north and south, this volume deepens our understanding of the importance of new functional and multifunctional approaches in policy, practice and theory. In rural areas of industrialized societies, food production as a basis for growth and employment has been declining for many decades. In the Global South, on the other hand, food production is still often the most important factor for socio-economic development. However, rural areas both in the industrialized north and in the global south are facing new challenges which lead to significant changes and threats to their development. New forms of food production, but also new functional (e.g. housing or business parks) and often multifunctional approaches are being discussed and practiced yet it remains unclear the extent to which these result in better or more sustainable development of rural areas. Contents: Part I Introduction: Introduction: dynamics in rural development beyond conventional food production, Peter Dannenberg and Elmar Kulke. Part II Dynamics in the Food Production Function: Regional linkages in the Kenyan horticultural industry, Peter Dannenberg and Gilbert Nduru; Factors influencing the market linkage of organic and conventional tomato farming systems in Karnataka, India, Nithya Vishwanath Gowdru, Wolfgang Bokelmann, Ravi Nandi and Heide Hoffmann; Breaking the lock-in to past industrial practices: triggering change in a mature industry, Diane M. Miller, Frank Calzonetti, Neil Reid and Jay D. Gatrell; Rural development through strengthened rural-urban linkages: the case of US local food systems, Becca B.R. Jablonski; A typification of short food supply chains and first insights into respective success factors and bottlenecks in North Rhine-Westphalia, Luisa Vogt and Marcus Mergenthaler. Part III Alternative Functions for Rural Areas: Renewable energies and rural development in Germany: business finance and the role of trust illustrated by two case studies from Brandenburg, Sabine Panzer-Krause; Securing local supply in rural areas: the role of wholesale cooperations in Central Hesse, Germany, Anika Trebbin, Martin Franz and Markus Hassler; Opportunities and threats to the development of organic agritourist farms in Poland, Ewa Kacprzak and Barbara MaAkiewicz; Agriculture in the NATURA 2000 areas in Poland: spatial differences in the absorption of financial means for sustainable development, Anna KoA'odziejczak; Linking locally: second home owners and economic development of the rural community, Krystian Heffner and Adam Czarnecki; Local governmental quality and the performance of medium and large companies across rural Vietnam, Kai Mausch and Javier Revilla Diez. Part IV Conclusion: Conclusion: perspectives and outlook on rural development, Peter Dannenberg and Elmar Kulke. Index. Dr Peter Dannenberg is Professor for Anthropogeography at the Department of Geography, University of Cologne, Germany. Dr Elmar Kulke is Professor for Economic Geography at the Department of Geography at the Humboldt-UniversitÃ¤t zu Berlin, Germany. The IGU Commission on 'The Dynamics of Economic Space' aims to play a leading international role in the development, promulgation and dissemination of new ideas in economic geography. It has as its goal the development of a strong analytical perspective on the processes, problems and policies associated with the dynamics of local and regional economies as they are incorporated into the globalizing world economy. In recognition of the increasing complexity of the world economy, the Commission's interests include: industrial production; business, professional and financial services, and the broader service economy including e-business; corporations, corporate power, enterprise and entrepreneurship; the changing world of work and intensifying economic interconnectedness.